Summary: Dressed in full "Dictator" garb, the comic assures fans that he has won his battle with the Academy. On Friday evening, the comic actor posted a photo of himself holding two Oscar tickets in one hand and a pistol in the other. Donning full Dictator garb, his caption reads: "VICTORY!" 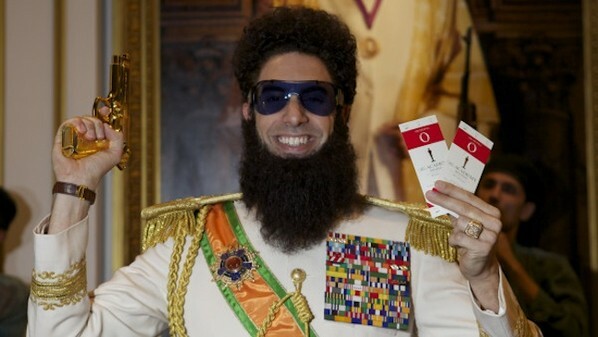 Just hours earlier, Oscar producer Brian Grazer told Extra: "We're thrilled to have him and he'll be on the red carpet dressed as The Dictator." Earlier in the day, Baron Cohen posted a video message online following reports that the expected stunt was unwelcome by the Academy. "While I applaud the Academy for taking away my right to free speech, I warn that if you do not lift your sanctions, and give me my tickets by 12 pm Sunday, you will face unimaginable consequences!" he said. "On top of all of this," Aladeen continued. "I paid Hilary Swank $2 million to be my date, and she will not refund a penny." This is hardly the first red carpet stunt the comic has pulled.